Though my pregnancy cravings thus far have been pretty controllable and luckily, have been for (mostly) healthy items….. sweets have been one that I have had to indulge in from time to time. While I think having DQ or cake once in a while is totally acceptable, I want to try to limit my consumption of refined sugars and processed foods (especially while pregnant). So started my search for “healthy” treats! They do exist and can be surprisingly easy to prepare! This recipe is easy-peasy if you own a food processor (I hope you do because they are an amazing investment in healthy eating). The main ingredients here are nuts (almonds, walnuts or pecans – you choose) and dates. Personally, I don’t love dates…. I dont even like date bars. 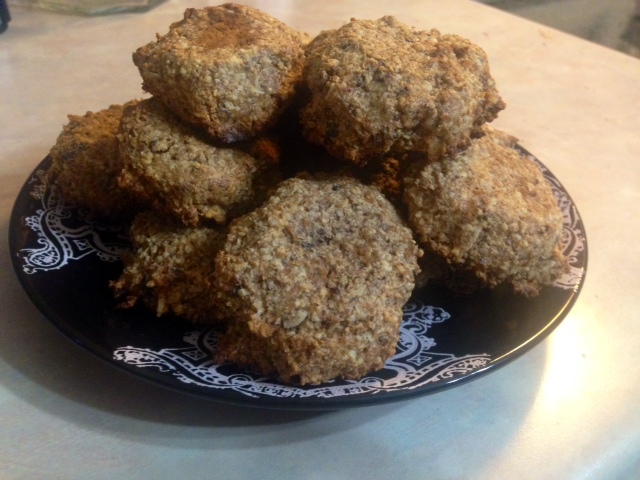 BUT – in this recipe they are used to naturally sweeten the cookies and I am actually so happy I tried this creation despite my initial aversion to using dates. I hope you guys give this recipe a go – I think this will be a hit even with the kiddies – its definitely going into my book of kid-friendly treats. 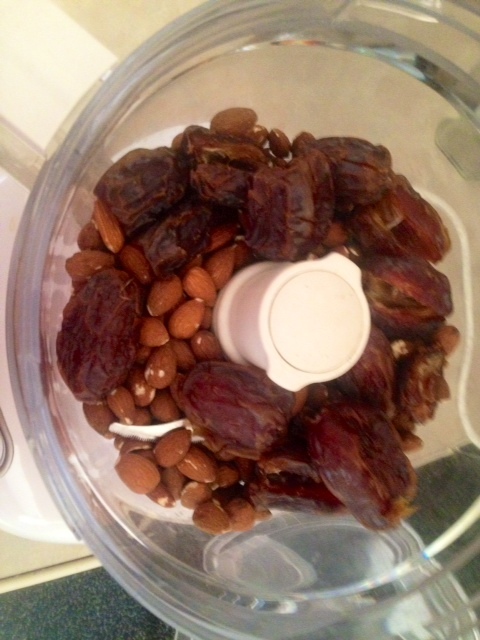 1 cup medjool dates (pitted) – I used 12 dates. 1. Pit your dates + preheat your oven to 350. 2. Place dates and almonds (or whatever nuts you chose) into the food processor and blend until they are pretty crumbly + combined. 3. Add your baking powder, sea salt, egg + maple syrup and blend again. This step makes your “batter” pretty gooey – it might ball up in the food processor before its completely combined. If this happens just stop the processor and smooth it down with a spatula – then finish combining. 3. Add in any ‘extras’ – I used coconut flakes and cocoa nibs. You can also add dried fruit or dark chocolate chips! Pulse a few times just to combine. 4. 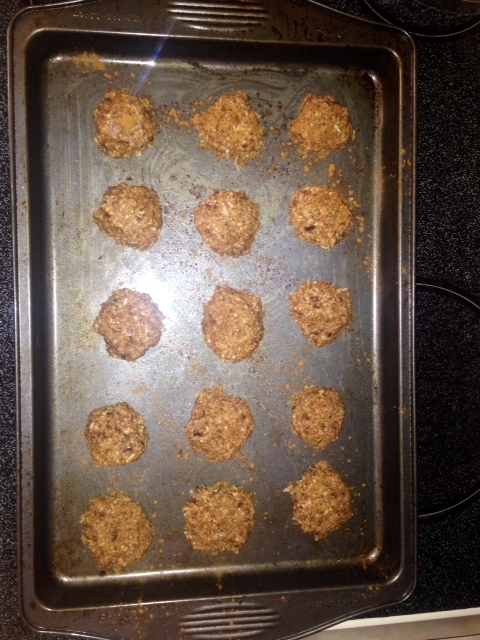 Using a spoon, spoon your cookies onto a greased (I used coconut oil) cookie sheet. Sprinkle with cinnamon and pop in the oven for about 10-12 minutes or until the edges are golden brown. Allow your cookies to cool completely before eating. 5. These will last (freshness) for a week or so in the fridge – but I am sure they will be eaten before that! This recipe makes about 12-15 cookies. Hope you try this one out! ENJOY.